A nobleman should always look his best, and so long as he is dressed in the Nobleman's Jacket, he will. This attractive jacket is made in a classic Renaissance era style, and is hand-crafted from high-quality, rich antique velvet fabric. Unlike typical velvet fabrics, this antique velvet fabric is somewhat lusterless, it does not have the shine that most velvets do and therefor, is somewhat muted in appearance. This gives the jacket a subdued coloration that helps the rich gold lace trim stand out even more. Gold lace trim decorates the front, back, shoulders, collar, and cuffs of this jacket. The gold trim, combined with the quality material, are basically the elements that help this jacket to stand out when compared against other renaissance jackets. Also featured are gold-metal buttons, which match the gold trim perfectly. The sleeves of this jacket are full-length and fitted to the arm. They end in cuffs decorated with additional gold-metal buttons and matching lace trim. When worn at the proper length, the Nobleman's Jacket should fall just barely above the knees. The interior of this beautiful, quality jacket is also fully-lined with satin, making it exceedingly comfortable to wear. 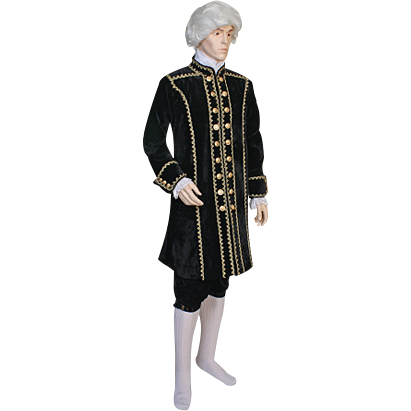 Pictured above, the jacket is shown with a white shirt underneath and a pair of knee-breeches, which are shown for effect but not included. If, like the nobles and royals of antiquity, you find yourself worrying about looking your best at the next renaissance fair, then banish those worries with the Nobleman's Jacket. 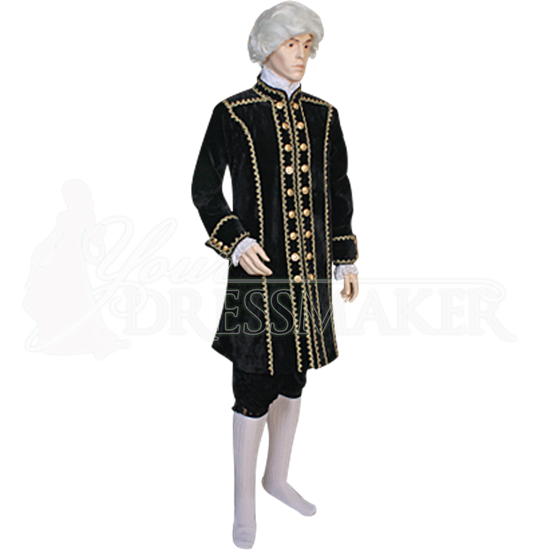 It is hard not to look great in this simple, yet attractive renaissance-styled garment.